RIO DE JANEIRO, Jul 31 2013 (IPS) - The decisions taken by the Brazilian government in the fight against drought in the country’s semiarid Northeast are an example of the disconnect between politicians and the citizens, which triggered an unexpected wave of protests in June. Even though the centre-left government of Dilma Rousseff embraced a solution that emerged from civil society – distributing rainwater collection tanks – it did so in a way that ignored essential aspects of the successful decade-long initiative, the organisers complain. “They didn’t listen to us,” said Naidison Baptista, one of the leaders of the Articulação no Semiárido Brasileiro (ASA) – the “Brazilian semiarid network” made up of nearly 1,000 non-governmental, community, labour, religious and smallholder farmer groups that was created in 1999 to provide clean water to poor rural families in drought-prone areas. Rousseff announced in July 2011 that by the end of her term in 2014, her government would distribute 750,000 rainwater tanks in the Northeast, through the “Water for All” programme, as part of the government’s poverty eradication efforts. That would have been a major triumph for the ASA movement, which had distributed 476,040 rural water tanks as of Jul. 17 – nearly half of its goal of one million. ASA’s tanks, along with the 750,000 promised by the government, would mean total coverage for the poor rural population in need of water in the Northeast, the country’s poorest region. Brazil’s semiarid Northeast region, as large as Germany and France combined, is home to 22 million of the country’s 198 million people, including 8.6 million peasants, according to the 2010 census. But the water tanks offered by the ministry of national integration, which is in charge of the government programme, are plastic, made by industrial companies, and are distributed through state and municipal governments. “It is the old model, without participation by the people,” Baptista told IPS. He said it was a return to a paternalistic relationship based on government donations, which generates dependency by the beneficiaries, because they don’t know where the tanks came from or how to maintain them. “If they don’t get involved in the construction process, they don’t take proper care of the tanks,” he said. The ASA tanks, by contrast, are made of prefabricated cement slabs produced by local workers and installed by the families themselves, who receive training in water management to make the rainwater they collect last for the entire eight-month dry season, and to ensure that it is always potable. This way, the tanks give a boost to the local economy, by using materials and services from nearby suppliers and increasing remunerated employment in a job-scarce market. “It is an endogenous, autonomous solution that helps people live in the Northeast’s semiarid conditions and distributes income,” Baptista stressed. He said the government programme, on the other hand, focuses the funds on a handful of far-away companies and strengthens the traditional “drought industry” – an expression that refers to the exploitation of tragedy by local elites who charge high prices for the dirty water distributed by trucks, benefit from federal aid, or dole out food, water or jobs to potential voters in an election year. Besides, a plastic water tank costs 5,090 reals (2,300 dollars), according to the ministry of national integration – more than twice the cost of a cement tank. That, multiplied by hundreds of thousands, reflects “big profits for industry,” Baptista said. ASA launched a campaign against the PVC water tanks after the government shifted to plastic tanks in late 2011. The movement complains that the plastic tanks exclude the local population from the process of installing and maintaining the tanks and sharing their knowledge and training. The national government argues that large-scale industrial production is necessary to accelerate distribution of the tanks for collecting and storing water for household and agricultural use at a time of prolonged drought. But Baptista said that argument is false, because ASA can mobilise up to 3,000 local organisations and expand its activities, if it has the financing. The government’s decision required institutional changes, because it transferred the reins of the project to local governments, at the expense of civil society organisations. A first consequence was that the ministry of social development suspended its financial support for the “One Million Water Tanks” (P1MC) programme that ASA has been carrying out since 2003 with funding from a diverse range of sources, including banks, companies and foreign donors, as well as the national government. But a Dec. 20, 2011 demonstration by some 15,000 people in Petrolina, a city in a major irrigated fruit-growing area in the Northeast, forced the ministry of social development to backtrack and sign a new agreement with ASA. The plastic tanks, which began to be widely distributed last year, have met with rejection in some communities. A few city governments, in Serra Talhada in the state of Pernambuco, for instance, have also refused to accept them. The plastic is deformed by the hot sun and “the water heats up, it hurts your stomach,” complained Rosalina Maria de Jesus, an indigenous woman who said she was “70 years old, more or less,” belonging to the Pankararú people in Pernambuco. Industrially-produced tanks deformed by the sun were replaced by new ones from the factories and the problem was corrected. But many people continue to believe that they cannot withstand the tropical sun for long. In some towns, the tanks pack the central square for weeks or months because of how slowly the municipal governments distribute them to rural families. In one case, in Maracás in the state of Bahia, 830 PVC tanks caught fire after spending 40 days in a municipal lot. 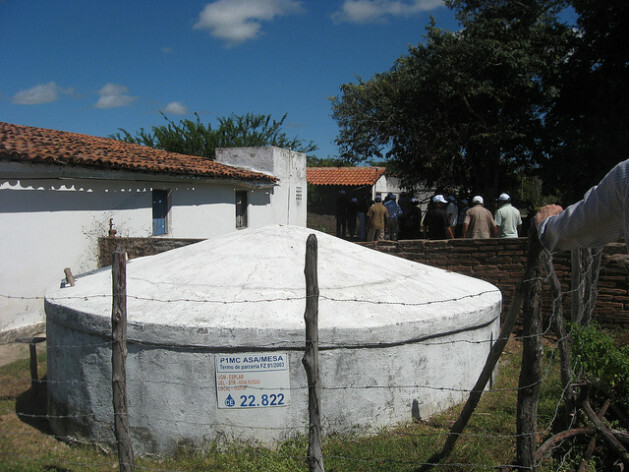 The cement tanks, which have been proven to last for decades, were created by a young peasant farmer who migrated to São Paulo in 1955, where he learned to make pools. After returning to Bahia, he invented the prefabricated slabs with which it is possible to make, in a few hours, the cylindrical tanks that are eradicating thirst and saving the lives of children previously cut short by contaminated water. The two kinds of tank are now operating side by side in the Pankararú village, as they are in many other municipalities. But critics say the plastic tanks reflect the penetration, in the government, of the old conception of “fighting drought” that led to failure after failure in the Northeast. The biggest current project in that respect is the diversion of the São Francisco river, designed to pipe water to 12 million people, mainly in cities, in the Northeast. The megaproject, which got underway in 2007, has drawn public criticism because of its growing costs, currently estimated at 3.7 billion dollars, and the constant delays in the construction of the 713 km of canals, aqueducts and tunnels, raising fears of another “white elephant” in the Northeast. Rather than “fighting drought”, the focus of ASA is on promoting “coexistence” with semiarid conditions, whose most noteworthy example is the rainwater tanks that serve the rural population, the hardest-hit by drought. The ambiguity of the Rousseff administration, which earmarks tiny amounts of financing to civil society projects like ASA in comparison to its huge investments in megaprojects, is one element that has fuelled the protests that have filled the streets of Brazil’s cities for the last two months. People are growing more and more sceptical, believing that national decisions have turned into business opportunities between government leaders and large companies.